Panda Bear New Baby Basket one of our great selections of baby gift baskets that is delivered to the door steps of the new parents to celebrate and welcome the newborn. Baby gift hamper Panda bear baby basket. 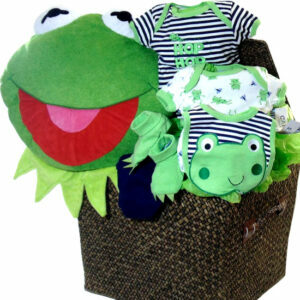 One of our great selections of baby gift baskets. Delivered to the door steps of the new parents to celebrate and welcome the newborn. 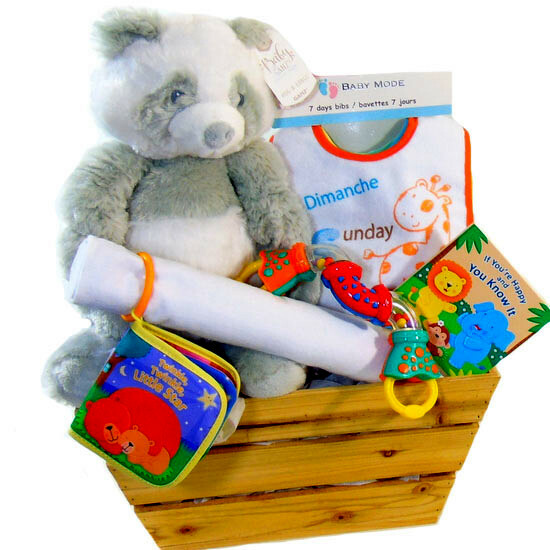 Baby gift hamper basket contains: Wood straight edges gift basket. Baby Ganz Collection Panda bear Hug-A-Longs. 100% Cotton white baby blanket. Bibs for 7 days of the week in English and French. Playgro grip & twist baby toy. Twinkle Twinkle Little Star baby book. If You’re Happy and You Know It baby book.